In the year of production on that pistol was 1913, beautiful piece to be a 105 years old it obviously spent a lot of time in the sock drawer. I recently picked up this little jewel but not as cheap as the OP did. It shows what kind of polishing and bluing was being done back in the day. It was me...I shot Liberty Valance. Does anyone have a lead on getting original Colt mags for a 1908 vest pocket? I have one that belonged to my Great Grandfather but the original mag is long gone. I do have one aftermarket but I'd like to make it whole again. "The soldier is the army. No army is better than its soldiers. In fact, the highest obligation and privilege of citizenship is that of bearing arms for one's country." 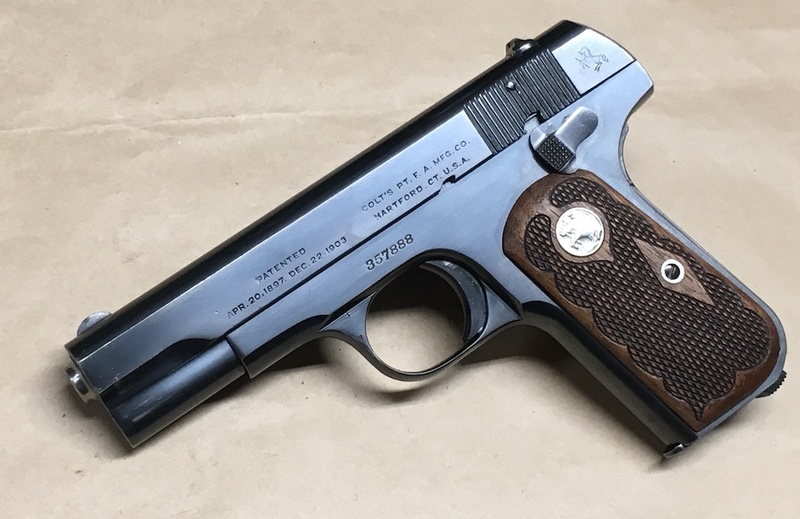 -General George S. Patton Jr.
Join the Colt Forum and after fifteen posts you can post on its classifieds...put something in the "wanted" section and you may find one. It's a great Forum as well and you might become a regular contributor. I'll check it out. I only own two. The 1908 and my AR that started life as a Colt Sporter. Those look like the Colt Custom Shop grips I've seen up on the web lately. Ran across them while on the constant search for the stylized "C" grips for my 1908. They've been tempting me, very beautiful! Life is nothing if you're not obsessed. I have a source in SW PA. He's off the grid, you need to call him, but he's sure to have what you're looking for. When I get time in the next couple of days I'll PM you his name and phone number. He only gets down here in MD for the big MD Antique firearm show in March. Wow, that's nice! The grips are immaculate! Not a fan of ivory on a revolver but they look good on a 1903/1908. I'm hoping they're original to the pistol which was made in 1920 and is in super condition outside of two light mars on the other side. I've already ordered an Archives letter from Colt to see if they're original. It still continues to amaze me how many guns of this vintage still survive on such beautiful shape. A member on the Colt Forum just came up with two NIB Colt Single-Action Army revolvers...one pre-WWII and one post-war Second Generation. The bluing and color-case hardening is exceptional and breathtaking.